At long last, the novel that nobody figured would ever get written! An Unrelated Story: another novel is a heart-rending work that reminds each and every one of us what it's like to be alive, especially on those dark nights, when you get up in the middle of the night and believe you've just heard someone rummaging about in your bathroom and have made your way to the closet, gotten out your largest and (you assume) most deadly pair of shoes, but are just going to sit tight in the closet for just a little while longer, clutching your deadly shoes to your chest (I wouldn't say 'heaving,' as it isn't one of those novels... or is, if you like that sort of thing), thinking perhaps that your toilet paper may have just come to life and is looking for some paracetamol or toothpaste or something and not wishing to alarm it by rushing in wielding a menacing-looking pair of shoes. It's also not finished just yet. "Ehm, oh, that's not mould." "I never said it was mould." "Well, it's not, you know." "Really? What is it, then?" In the grand tradition of putting lots of words together in some sort of order between a few cardboard covers, this one fails pretty miserably, for the moment. But it does succeed in being lots of words scattered around sheaves and sheaves of paper, mostly illegible due to the unfortunate accident that apparently befell the author in which he lost the use of both of his hands and was required to write out the novel with a pen stuck between his teeth on an impressive volume of cocktail napkins. Including You. So don't look so smug. 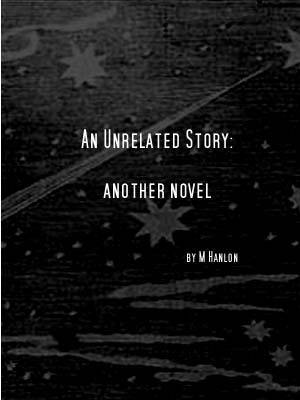 M. Hanlon is the author of two other novels; the utterly confusing Time: a novel and the aptly named God Coffee, I Miss You. Both of which are considerably more finished than An Unrelated Story: another novel. "[An Unrelated Story: another novel] is crime fiction without so much of the crime, and definitely no corn."